WHY, WHY, WHY, don't those responsible for public works protection and maintenance use the VETIVER SYTEM ? 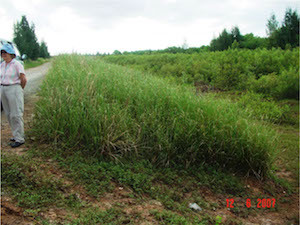 Since 2000 the Vietnamese provincial governments have been testing and using the Vetiver System, at large scale, for highway (Ho Chi Minh Highway) - http://www.vetiver.org/ICV6_PROC/BIOENGINEERING%20/1%20Tran%20Tan%20Van%20Presentation.pdf - and for Sea Dyke Protection in the Mekong Delta http://www.vetiver.org/VNN_Estuary%20dikes.pdf - These are a very important applications and show the impact of vetiver over 8-15 years of use. When the Vietnamese under take trials, they don't mess around with a few meters, instead they think kilometers! I can see VS application for highway and sea dike protection in many countries, but specifically in south and East Asia (China, Philippines, Indonesia. Thailand, Malaysia, Indonesia, Bangladesh and India). VS protection is long lasting and a very low cost (as much as 90% over conventional practices). The Vietnamese experience is FACT not FICTION and is applicable most places in the tropics. Why is it not being used widely? Many answers - the most important being: lack of knowledge, "too good, too cheap" syndrome (in other words PROFITS), and entrenched traditional habits or ignorance by those responsible - and in the latter I include many of the international and bilateral agencies! Please CORRECT me if I am wrong. Thank you Vietnam for showing the way.